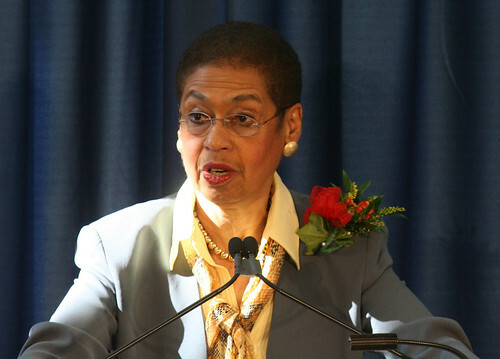 Congresswoman Eleanor Holmes Norton may not have a vote on the House floor, but she does serve on several powerful committees and subcommittees where the esteemed Delegate for the District of Columbia does have a vote and a good deal of clout. One of those committees is the Transportation committee, on which she sits, and is also a member of the Aviation Subcommittee. In addition, she serves as a member of the Homeland Security Committee which oversees the DHS and their sub agency, the Transportation Safety Agency. The TSA has come under heavy fire in the past two weeks over the deployment of millimeter-wave and backscatter scanners which allow the TSA to peer through a passenger’s clothing and look for harmful objects. Many object to these new imaging solutions as they can tend to be fairly graphic, (potentially NSFW) and have lead to mockery of genital size among TSA employees and assaults. Yesterday, we had a few minutes to spend with the Congresswoman and asked her about these new scanners, and what she thought Congress might do. The transcript is below the cut, but I can spoil it a bit: I was hoping for better from the Congresswoman. Thanks very much to Casting Words for transcribing our interview. We Love DC: Thank you so much for agreeing to talk with me today. I really appreciate it. The issue that has been on the minds of DC residents has been the backlashes surrounding the Transportation Safety Agency. And you have a very unique perspective on this, sitting on both the Homeland Security Committee and on the Transportation Committee. I was hoping you might be able to talk to us a little bit more about what you are seeing in terms of the response to the recent policy change surrounding pat downs and millimeter wave scanners. Congresswoman Eleanor Holmes Norton: Well first I am on the Aviation Sub Committee of the Transportation Committee which makes me really particularly interested. My recollection is that there was an amendment on bar and since I can vote in the committee as a whole I get to vote in the committee. As this amendment would have barred the use of a whole body imaging technology. Because of my role here in the nation’s capital and on the Homeland Security Committee and on the Aviation Sub Committee I do think that we should by amendment bar the TSA going forward. So I believe that if we want to do it, we would need a hearing now that I see what has to be done to hearing. As this began to happen I can tell you more than ever we need a hearing. Two of our own airports here Reagan and Dallas are already using this technology. And yet we are beginning to find out about this technology in any detail only now when apparently it’s already being used in 60 or more airports and galloping toward use in hundreds and then probably every airport in the country. That’s a bit fast. And at least I cannot recall any hearing on this subject. If there had been a hearing for example, we might have seen the images. And I was shocked at the so called “nekkid scanners” because we were assured that nothing resembling the human body would come out. That almost resembles that the very person. That is a virtual silhouette of the person. So I don’t think we were told the truth when this came out. Now, I have seen another example where the body was really quite jaded or distorted. And then on top of this we see that we were told that these images would be destroyed right away. We Love DC: Right. And now it seems they’re sticking around a little bit longer. Del. Norton: Well, right away the press was able to get them. Other people can freedom of information as quickly as whoever this person was got it. But beyond that, TSA was apparently talking only about itself, that they would be discarded right away. Well there may be, I don’t know, if one Marshall’s office in Florida could get it, I have to assume there are hundreds of federal officials who could get these before they were destroyed. Maybe he had only the one in Florida. But I need to know that. And there is no hearing that talks to me about that, nor has any hearing or any other information I’ve had access to inform the Congress about the possible exposure to radiation. Now we know and already recognize there would be some exposure to radiation. And frankly when I heard that it was something like 2,000 less exposure than x-rays and something like 200,000 less than in CT scan is, I was confident until the very experts who said that said they still said it with great caution. Well, what is their caution? I think their caution may be although it has not been revealed, that will need a hearing. They’re caution may be, for example, business and frequent travelers, say if you get in airplane once every few years maybe you are fine. How can you even know that? We Love DC: Right, exactly. Del. Norton: So when we are talking, it’s one thing to say children are apparently under 12, but we know full well that young people are still in a formative stage well above that. So you are telling me a 13 year old has to go through this radiation how often? Del. Norton: I do have a concern that… I would not eliminate them, but I would put a kind of TRO or Temporary Restraining Order until there is a hearing. We Love DC: Sure. And is that something you’d like to see your colleagues and you move forward with? A TRO against the new scanners? Del. 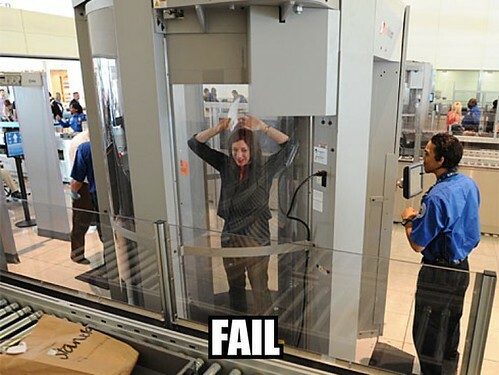 Norton: I would like to see the TSA stop distribution until a hearing is held and the Congress not necessarily to cease using the scanners altogether but to see if something further is perhaps needed, like warnings, whether it’s …or some other kinds of scanners. I need to know about these scanners used world wide, and I too recognize that they are used all over the world, and apparently are common all over the world. But I don’t have any of that information. If they’ve been used longer than we have used them, they perhaps have something to tell us. I tell you, I recall reading, because we’ve not had a hearing that I can recall, that the machines being used were incapable of saving these images. [laughs] I don’t know what machines they were talking about, if we were able to look at images that were indeed transmitted. And then there is a difference between the “nekkid scanners” and the scanners that are not nearly so nekkid and that may be more acceptable. So why would any “nekkid scanners” be used? We Love DC: One of the other questions that has come up a lot is about the new enhanced pat-downs that are happening when people opt out of these machines. And I know that several people have concerns about both religious issues dealing with that particular touching that happens, as well as what feels like a retaliatory factor for using these new enhanced pat-down techniques. We Love DC: It makes a lot of people uncomfortable. Del. Norton: Let me finish, please. [laughs] That goes without saying that it’s uncomfortable. I’m making another point. The point I’m making, because these are the points I have to consider because [laughs] I am, above all, for safeguarding the nation’s capital. But therefore, I’m very afraid of a lawsuit. And the reason I’m afraid of lawsuits is that if the only alternative are a pat-down that is particularly intrusive and never allowed except when a crime is probable cause to believe that such a pat-down is necessary, or a just-as-intrusive body scan that shows your full body, that may be subject to a Fourth Amendment attack. I’m very concerned that the pilots have brought a lawsuit themselves. I wonder if there’s something we can do for the pilots. These are people who get on planes all the time. They’re the last ones who want to be subjected to radiation every single time they come into a new airport. I don’t know if one could at least exempt such people who are frequent fliers, because they’re doing service to the public, by giving us their fingerprint or their thumbprint and, of course, the badge they wear, just to protect them, who are already subject to more exposure to radiation because they are exposed through flying itself. [laughs] That’s a question that I don’t think we should proceed until a hearing is called for. We Love DC: And do you see that happening under the next Congress? Del. Norton: I hope it can happen under this Congress. I’m not sure. You notice that we haven’t done anything this week but do the fundamentals of being organized. But I would think that rather than keep, particularly if we were to cease using it for the time being–and I would hope we do that–then we’d need the earliest kind of hearing to decide whether to proceed. Del. Norton: Well, at the same time, I really don’t think that is the reason. It’s certainly not the reason I’m for it. The other side will cite you more than 80 percent of the public that says they are for this. Now, the public will always be for whatever looks like it keeps them safe. Our job, as members of Congress, is to see whether this is the only alternative and the best alternative. We Love DC: I certainly think that’s very wise. I think that covers about the issues that we were looking to talk about today. Thank you so much for your time. I appreciate it. We Love DC: And as a constituent, my own personal message is that a boarding pass is not probable cause. Del. Norton: We’ve already tolerated a lot. We Love DC: Indeed. This is a bridge too far. We Love DC: Oh, I hope not, too. [laughs] Thank you so much, Congresswoman.